Jyväskylä (Finnish pronunciation: [ˈjyʋæsˌkylæ]) is a city and municipality in Finland in the western part of the Finnish Lakeland, some 130 km north-east from Tampere. It is the largest city in the region of Central Finland and on the Finnish Lakeland. Elias Lönnrot, the compiler of the Finnish national epic, the Kalevala, gave the city the nickname "Athens of Finland". This nickname refers to the major role of Jyväskylä as an educational centre. The works of the most famous Finnish architect Alvar Aalto can be seen throughout the city. The city hosts the Neste Oil Rally Finland, which is part of the World Rally Championship. It is also home of the annual Jyväskylä Arts Festival. As of 31 January 2019, Jyväskylä had a population of 141,374. The city has been one of the fastest growing cities in Finland during the 20th century. In 1940, there were only 8,000 inhabitants in Jyväskylä. The Jyväskylä sub-region includes Jyväskylä, Hankasalmi, Laukaa, Muurame, Petäjävesi, Toivakka, and Uurainen. The second part of the city's name, kylä, means village. 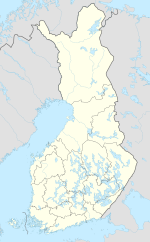 The first part of the city's name, jyväs-, looks like the stem of an adjective *jyvänen, derived from jyvä, "grain" (compare Wiktionary). Alternatively, it has been associated with Taxus, a genus of yews, and the Old Prussian word juwis. It has also been speculated that the word jyväs refers to the sun's reflection of the surface of the water. In the Jyväskylä region, there are archeological findings from the Stone Age. According to the oldest available taxation documents (maakirja), there were seven estates on the Jyväskylä region in 1539. One of them, the estate of Mattila, alone possessed the areas stretching from the village of Keljo to the villages of Vesanka and Palokka. The oldest estate in Jyväskylä continuously held by the same family is the estate of Lahti, which emerged when the estate of Mattila was split between two brothers in 1600. The history of the estate of Lahti and the family of Lahti have had a significant impact on the development of Jyväskylä region. Lahdenrinne, in the south-west corner of Jyväsjärvi lake, belongs to the old heartland of the estate of Lahti. The City of Jyväskylä was founded on 22 March 1837, when Emperor of Russia and Grand Duke of Finland, Nicholas I of Russia, signed the charter of the city and the infrastructure was essentially built from scratch. At the times Finnish military battalion Suomen kaarti participated under his rule in military operations against the Polish November Uprising and later in Hungary, Turkey and Bessarabia (today Moldova). While Nicholas I of Russia abolished many autonomous areas, it has been argued, that the loyalty of Finnish military influenced his approach towards Finnish autonomy. The original town was built between Lake Jyväsjärvi (which is connected to Lake Päijänne) and the Jyväskylä ridge (Harju), and consisted of most of the current grid-style city centre. The establishment of schools in the 1850s and 1860s proved to be the most significant step in regards to the later development of Jyväskylä. The first three Finnish-speaking schools in the world were founded in Jyväskylä, the lycée in 1858, the teachers’ college in 1863, and the girls’ school in 1864. Well-trained teaching staff and pupils from different parts of the country changed the atmosphere of Jyväskylä irrevocably. In the early 20th century, the town expanded several times. Most of today's Jyväskylä was built after the Continuation War, when refugees from Karelia and other parts of the country moved to the city, and housing was badly needed. During the 21st century Jyväskylä has grown fast – by over 1,000 inhabitants every year. Säynätsalo was consolidated with Jyväskylä in 1993, and Jyväskylän maalaiskunta and Korpilahti, for their part, on January 1, 2009. Palokkajärvi two kilometres (1.2 miles) north from the city center is one of the numerous lakes in Jyväskylä. Jyväskylä is located on the northern coast of Lake Päijänne, 147 kilometres (91 mi) north-east of Tampere and 270 kilometres (170 mi) north of Helsinki. The hilly and forested terrain in Jyväskylä is surrounded by hundreds of lakes. To reach Jyväskylä from East, one needs to go through or pass the hill Kanavuori, which used to host a military depot full of ammunition and armaments. Jyväskylä is located in the Finnish Lakeland. There are 328 lakes in the city, and lakes and rivers constitute 20,1% (295 km2) of the total area of the city. The city's largest lakes are Päijänne, Leppävesi, Tuomiojärvi, Palokkajärvi, Luonetjärvi, and Alvajärvi-Korttajärvi. The city center is located on the shores of a small Jyväsjärvi. The landscape in Jyväskylä is hilly, forested and full of waters. The architect Alvar Aalto compared the hilly landscape of Jyväskylä to Toscana in Italy: "The slope of Jyväskylä ridge is almost like the mountain vineyards of Fiesole". The defined climate is a subarctic continental (Köppen: Dfc). Because of its northern location, winters are long, snowy, cold, and dark. During midwinter, the city receives daylight for only around five hours. Summers are mild, with the average daily maximum temperature being 22 °C (72 °F) in July. During the summer, Jyväskylä experiences long daylight and white nights i.e. midnight twilight. Jyväskylä was the fastest growing Finnish city in the 20th century. The population has continued to grow rapidly in the 21st century. 96.7% of the population spoke Finnish as their first language in 2010. The share of Swedish speakers was 0.2%. Other languages made up the remaining 3% of the population. In year 2014, there were about 3,700 foreigners in Jyväskylä. The largest immigrant groups in Jyväskylä are Russians, Estonians, and Afghans. Jyväskylä hosts the headquarters of Finnish Air Force, in Tikkakoski. As a central location, it has traditionally been important base for military operations. Jyväskylä got also known as major firearms manufacturer (Tikkakoski) during the world wars, producing machine guns and ammunition. According to reporting in Helsingin Sanomat, since the 1990s Jyväskylä has served as a signals intelligence collection site, primarily targeting military maneuvers around St. Petersburg. Once a factory, now a school, Schauman factory is now used by the Jyväskylä University of Applied Sciences. Agora Center is a good example of the modern heart of the economy in Jyväskylä. It is a workplace for teachers, scientists, and IT workers. Jyväskylä is an important hub of information technology. Innova Tower hosts many high-tech companies. Because of excellent connections, Jyväskylä was a busy marketplace even before the first permanent settlements were founded in the current city centre. The establishment of Finland’s first three Finnish-speaking schools: the lycée in 1858, the teachers’ college in 1863, and the girls’ school in 1864 proved to be the most significant steps in regards to later development of Jyväskylä. Educational services became the heart of the economic growth of the city. In 1912 Wilhelm Schauman founded a plywood mill on the shores of Jyväsjärvi. Soon other kinds of forest based businesses opened factories and premises in the city. Thus, lumber, pulp, and paper became the second stronghold of the economy in Jyväskylä. Later, the high quality education and paper machinery industry tempted information technology businesses to settle in the city. Nowadays, the main sources of substinence in Jyväskylä are educational and health care services, paper machinery production, information technology, and renewable energy. The most important private employers are paper machinery producer Metso ltd., retail trade company Keskimaa Cooperative Society, real estate service company ISS, and wind turbine gear manufacturer Moventas. The biggest public employers are the City of Jyväskylä, the Central Finland Health Care District, the University of Jyväskylä, and the Air Force Academy. As of 2010[update], only 1% of the labor force works on the primary sector, 21% on the secondary sector, and 78% on the service sector of the economy. In April 2012, the unemployment rate in Jyväskylä was 12.2%, which was higher than average in Finland (9.8% in 1/2012). As of July 2012, there are about 61,000 jobs in Jyväskylä. The average income per income earner was €24,380 in 2010. In 2011, Jyväskylä topped in an image evaluation study among businesses. The city reached the highest score of large Finnish cities in the study, succeeding especially in the availability of skilled work force, on commercial services, on transport connections, and on geographical location. 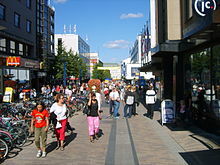 The Gross domestic product per capita in the city of Jyväskylä was €33,688 in 2005. The self-sufficiency in workplaces exceeded 100% in the city, raising the GDP per capita higher than the national average. The GDP per capita of the whole Jyväskylä region was €28,718 in 2007. The regional GDP per capita is lower than the Finnish national average, mainly due to high number of students and a relatively high unemployment rate. Functionalistic Säynätsalo Town Hall by Alvar Aalto is open also for visitors interested in his architecture. 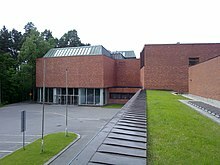 The Alvar Aalto Museum and the Museum of Central Finland form a center of culture in the immediate vicinity of the historical campus of the University of Jyväskylä. Both museums are designed by functionalist Alvar Aalto. The Alvar Aalto Museum displays the artist's most important work and design. The Museum of Central Finland specializes in cultural history. It serves both as the town museum of Jyväskylä and the provincial museum of Central Finland. In summer 2015 Alvar Aalto Foundation and the city of Jyväskylä launched an architect competition to connect the two museums. One of architect Aalto's most significant works, Säynätsalo Town Hall, is located in Säynätsalo island. The city hosts the Craft Museum of Finland, which presents a range of different handicraft techniques from across the country, as well as a centre dedicated to the conservation of textiles that serves private customers, museums and organisations. The National Costume Center of Finland forms a part of the museum. 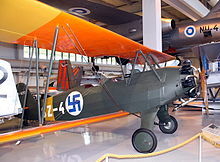 The Aviation Museum of Central Finland near the Jyväskylä Airport in Tikkakoski exhibits the aviation history of Finland. The University of Jyväskylä Museum is specialized in the history of the University and diversity of nature in Central Finland. Jyväskylä Art Museum, located the city centre is the regional art museum of Central Finland. In collaboration with the Centre for Creative Photography, the Jyväskylä Art Museum maintains The Ratamo Printmaking and Photography Centre. This centre consists of the Galleria Ratamo along with a printmaking workshop, photography studio and artist workspaces all situated in Jyväskylä’s former roundhouse. 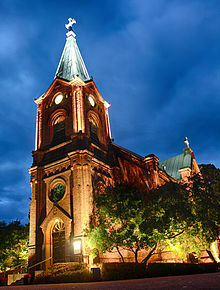 In addition, historical churches in the city are open for public, most notables of them being the Taulumäki Church and the Jyväskylä City Church. The biggest theater in the city is the Jyväskylä City Theatre, designed by Alvar Aalto. It stands right in the center of the city. 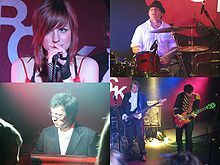 Members of Agent M performing in Jyrock festival in 2007. Arctic and Fabulous Film Festival offers different forms and genres of Nordic film in the middle of most freezing winter season in February. Jyväskylä City's Birthday Week (last week of March) offers a number of concerts, theatre, exhibitions and debates around the city. Jyrock in April is an indie and alternative rock and pop festival. Lutakko liekeissä in August is a rock festival held in rock club Tanssisali Lutakko. Yläkaupungin Yö in May is one of the biggest annual street festivals of the city. Sataman Yö is an annual pop music festival organised one week before the midsummer in the harbour of Jyväskylä. Jyväskylä Arts Festival in the middle of July accommodates musicians, bands, contemporary circus, comedians, mimes, physical theatre, storytellers and film makers. It is one of the most well known festivals in Finland. Neste Oil Rally Finland in the end of July is the biggest annually organised event in Nordic countries and a part of the WRC World Rally Championships. Athenis Finlandiae organised in August is a cultural festival combining elements from ancient history, arts and science. Finlandia Marathon in the beginning of September is a marathon festival designed for everybody from a top athlete to an amateur jogger. Time of Dance – the largest annual festival of Finnish contemporary dance is taking place in the end of September. The International Print Triennial Graphica Creativa is organised every three years since 1975. It was the very first international graphic art exhibition in Finland. The latest triennial was organised in 2012. Synergia-areena is the main ice hockey venue. The University of Jyväskylä is the only university in Northern Europe with a faculty of sports. The faculty has been a key player to develop a strong sports culture in the city. The city hosts the Neste Oil Rally Finland (formerly known as the 1000 Lakes Rally). It is the biggest annually organised public event in the Nordic countries, gathering over 500,000 spectators every year. The rally has been held since 1951, first as a national competition, then from 1959 on as a European Rally Championship event and since the introduction of the World Rally Championship in 1973, as Finland's WRC event. Ice hockey venue Synergia-areena, Hippos Finnish baseball stadium, swimming hall AaltoAlvari, and many other primary sport venues of the city are located in Hippos, two kilometres (1.2 miles) away from the city centre. The Matti Nykänen ski jumping hill is located next to the Laajavuori ski resort just few kilometres west from the city centre. The main football stadium lies on the slopes of Harju just next to the city centre. 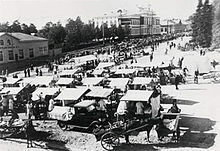 The Killeri hippodrome on the western parts of the city serves different horse racing competitions. At winter time, amateur ice skaters can practice their skills in Viitaniemi or on the lake Jyväsjärvi, which has a 3.5 km (2.2 mi) long ice skating track. The inventor of Finnish national sport pesäpallo, Lauri "Tahko" Pihkala, studied and lived in Jyväskylä. The Upper secondary school of Jyväskylän Lyseo hosted the historic event of first pesäpallo match in world in September 1920. JYP plays in the top-tier Finnish mens ice hockey league, SM-liiga. 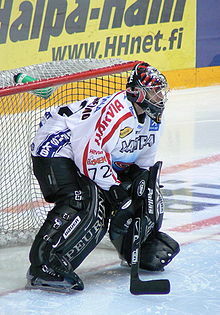 The team was the 2009 and 2012 Finnish Champion. The team also won the European Trophy in 2013 and the European Champions Hockey League tournament in 2018. Jyväskylän Jalkapalloklubi (JJK Jyväskylä) plays as of 2017 in Veikkausliiga, the premier division of Finnish football. JyPK, Jyväskylän Pallokerho is a women's football team, playing as of 2017 in Naisten Liiga, the premier division of Finnish football. FC Vaajakoski plays in Kakkonen, the third tier of the Finnish football league system. FC Blackbird plays in Kolmonen, the fourth tier of the Finnish football league system. Jyväskylän Seudun Palloseura (JPS) plays in the highest bandy division, bandyliiga, and won in 2019 the national championship for the first time. 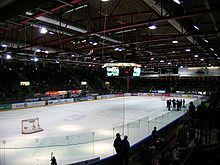 Their home arena is the Vehkalammen kenttä. Jyväskylä Track and Field Club (JKU) is one of the leading track and field clubs in Finland. 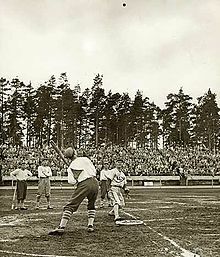 Jyväskylän Kiri is the most successful Finnish baseball team in history. Currently they play in the top division Superpesis. Jyväskylän Saukot plays water polo in the Finnish top division both in men and women. Kampuksen Dynamo (KaDy) plays futsal in the Finnish top league. Kirittäret holds ten Finnish Championships in women's Finnish baseball league. Latest championship is from summer 2010. Jyväskylän seudun Jaguaarit plays in the top division of Finnish American football league. Happee plays floorball in the Finnish top division both in men's and women's league. Men´s Finnish Championship in 2014. Jyväskylä Freestyle Club is the main freestyle skiing club. Jyväskylä Ski Club (JHS) is one of the most well known cross-country skiing, ski-jumping, alpine skiing, snowboarding, Nordic combined and biathlon clubs in Finland. Meloiloa Canoe Club: plays canoe polo, and practices whitewater slalom, canoe racing, wildwater canoeing and marathon kayaking..
Jyväskylä Rugby Club: plays rugby union (rugby) at the highest national league. Former national champions. Jyväskylän Fight Club: is the city's most successful martial arts and Brazilian Jiu-Jitsu academy. Mukwan is a well-known Taekwondo martial arts club in Jyväskylä since 1984. Liikunnan Riemu plays futsal in the Finnish top league since 2013. Jyväskylän Liitokiekkoilijat Ry (JyLi Ry) competes in Ultimate, Disc golf and other disc sports. Jaguars Spirit Athletes (JSA) is the main cheerleading club. Toyota Gazoo Racing WRT, the official Toyota world rally team run by 4-time world champion and Jyväskylä native Tommi Mäkinen. The city council of Jyväskylä is the main decision making body at the local level. Its 75 members are elected every fourth year in municipal elections. The city council elects the mayor. The current mayor is Timo Koivisto. 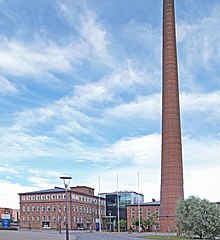 The prevalence of the social democratic party can be explained in part by the Vaajakoski, a major industrial center historically that is currently part of Jyväskylä, and its heritage of industrial workers voting social democrats. Jyväskylä was the only place during the 2017 municipal elections where the Green League was the largest party. The city of Jyväskylä is divided into fourteen wards (suuralueet; storområden), which are further divided into 89 districts. The ward division does not always follow district boundaries. Lutakko is a neighbourhood close to the city centre. Jyväskylä was founded in the northern end of the lake Päijänne at the crossroads of three major waterways. Lakes control the cityscape. The city grid plan from 1833 by Jacob Leonard Boringh can be well recognised in the city center. Nevertheless, due to very rapid population growth, the cityscape has gone through one of the most massive changes in all of Finland. Nowadays, Jyväskylä is a city of modern architecture. The city has more buildings designed by one of the best known international functionalist architects Alvar Aalto than any other city in the world. The establishment of schools in the 1850s and 1860s proved to be the most important step from the point of view of the later development of Jyväskylä. 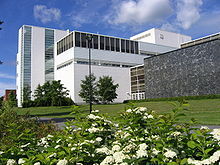 The headquarters of the University of Jyväskylä are considered to be Aalto's masterpieces. Later, a modern architect Arto Sipinen, a pupil of Aalto, has influenced the cityscape since the 1970s by designing most of the new university buildings in the city. The outskirts of the city are mainly populated by student apartments and single-family houses. Some of the most important buildings, like Säynätsalo Town Hall, designed by Aalto are located outside the city centre in Säynätsalo and Muuratsalo. Consolidated areas Korpilahti, Jyväskylän maalaiskunta, Säynätsalo and also western parts of Jyväskylä are mainly countryside dominated by hilly forests and lakes. A 360 degree panorama of Jyväskylä taken from the Horisontti building. From left to right: Lutakko with the city centre and Harju in the background, lake Jyväsjärvi, Kuokkala bridge with Kuokkala neighbourhood and Kuokkala water tower in the background, and Ylistönrinne campus. Jyväskylä Lyceum (Finnish: Jyväskylän Lyseon lukio) is the world's first junior secondary school with Finnish as the language of instruction. It started its first term on 1 October 1858 and turned 160 years old in 2018. Lyceum still exists and is one of the nine upper secondary schools in the city. Due to this, among other things, the city has earned the nickname Athens of Finland. The teacher training college later evolved into the College of Education (1934) and further into the multidisciplinary University of Jyväskylä (1966). The University of Jyväskylä is one of the most popular universities in Finland. Almost 16,000 students are enrolled to study for a bachelor's or master's degree, and the university also offers PhD programs in most of its subjects. Historically, the university has excelled in the study of education, but in the last few decades it has also gained respect in the sciences. It is the only university in Finland offering university-level education in sports, training sports teachers and coaches. Today the University offers also Cyber Security degrees, in close co-operation with the Finnish Defence Forces. According to the Ministry of Employment and the Economy the city has been acknowledged in 2013 as the Cyber Security City, providing a portfolio of Cyber Security related studies and activities. JAMK University of Applied Sciences has 8.000 students. It has four different units: School of Business and Services Management, School of Health and Social Studies, School of Technology and Teacher Education College. HUMAK University of Applied Sciences educates cultural management in Jyväskylä. S81 passing Pumperinmäki at Jyväskylä. Jyväskylä is in the crossroads of main road and railway networks. Steamboat S/S Suomi leaving the Jyväskylä harbour. Jyväskylä railway station is served by VR direct trains to Helsinki, Pieksämäki, Tampere, Turku, Vaasa and many other destinations in Finland. The station was extensively modernised in 2002. Jyväskylä Airport is situated in Tikkakoski, about 20 kilometres (12 mi) north of Jyväskylä. It has regular direct flights to Helsinki Airport. The airport serves also as a military and charter airport. The city is on crossroads of many main roads of Finland. European route E75 passes the city from south to north, and E63 from southeast to northwest. Jyväskylä harbour is home to many passenger ships operating on lake Päijänne. 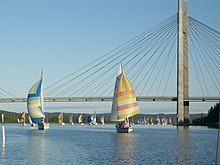 During summer time, there are direct ship connections to Lahti, Jämsä, Suolahti, Viitasaari, and some other cities. The public transportation system of Jyväskylä is managed by the city under the Linkki brand and operated under contract to the city by Jyväskylän liikenne. It is based on bus lines. The Stavanger Park, close to the city center, is named after Jyväskylä's Norwegian twin city Stavanger. Korpilahti was consolidated to Jyväskylä in 2009. Photo from Putkilahti village. Markus Grönholm drives his Ford Focus WRC out of the service park at Paviljonki during Neste Rally Finland 2006. Asteroid 1500 Jyväskylä (named after the town by its Finnish discoverer, Yrjö Väisälä). ^ Tervoja, Pia (August 2008). "Bene veniatis in urbem Jyväskylä". City of Jyväskylä. Retrieved 27 February 2012. ^ a b "A short history of Jyväskylä". A short history of Jyväskylä. City of Jyväskylä. Retrieved 2011-12-02. ^ a b "Jyväskylän kaupungin elinkeinoelämän vaikuttavuus 1990-luvulla" (PDF). Jyväskylän kaupungin elinkeinoelämän vaikuttavuus 1990-luvulla. University of Jyväskylä. ^ a b "Mouvement de la Population de Finlande en 1939" (PDF). Official Finnish population statistics 1939. Finnish Government. ^ Kosonen, Ilmari (28 February 2005). "Miten Sissoset muinoin saivat nimensä jousipuusta?". Saunan synty. Sissosten sukuseura ry. Retrieved 26 February 2012. ^ Hallikas, Jarmo (2010). "Ritoniemi hämäläisten eräalueesta viihtyisäksi asuinalueeksi". Ritoniemi hämäläisten eräalueesta viihtyisäksi asuinalueeksi. Jarmo Hallikas. Retrieved 9 August 2015. ^ Landström, Rita (2007). "Jyväskylä - Suomen Ateena". Jyväskylä - Suomen Ateena. Yle. Retrieved 9 August 2015. ^ a b c d Jäppinen, Jussi; Voutilainen, Heli-Maija (2003). "Schools for non-Swedish Speakers". From Marketplace to a Wonderful Town - A Brief Introduction to the History of Jyväskylä. City of Jyväskylä. Retrieved 26 February 2012. ^ "Jyväskylän kaupungin väestöarvio". Väestötilastoja. City of Jyväskylä. 2012. Retrieved 15 September 2012. ^ "Jyväskylä". Järviwiki. Finland's Environmental Administration. 2012. Retrieved 26 February 2012. ^ Nature and space: Aalto and Le Corbusier. Routledge. 2003. Retrieved 2010-07-17. ^ "Jyvaskyla, Finland Köppen Climate Classification (Weatherbase)". Weatherbase. Retrieved 2019-03-03. ^ "FMI open data". FMI. Retrieved 30 August 2017. ^ "City of Jyväskylä: For immigrants". City of Jyväskylä. 2014. Retrieved 2 February 2015. ^ Fitsanakis, Joseph (December 19, 2017). "Journalist destroys computer with hammer during security raid in Finland". intelNews. Retrieved December 19, 2017. Based on classified documents dating as far back as 1999, the article claims that the Finnish intelligence services have operated the top-secret program in Jyväskylä for years. It focuses on monitoring the maneuvers of Russian military units stationed around the St. Petersburg area, allegedly by tracking electromagnetic radiation emissions. ^ Tommila, Päiviö (1972). Jyväskylän kaupungin historia 1837–1965. I osa [History of Jyväskylä City. Vol I.] (in Finnish). Jyväskylä: City of Jyväskylä. pp. 17–18. ISBN 951-95011-2-6. ^ "Jyväskylä 2011". City of Jyväskylä. 2 December 2011. Retrieved 26 February 2012. ^ "Business". City of Jyväskylä. 25 June 2012. Retrieved 9 July 2012. ^ Lauri Hiltunen (21 February 2012). "Keski-Suomen työllisyyskatsaus tammikuu 2012". Central Finland Centre for Economic Development, Transport and the Environment. Archived from the original on 29 July 2012. Retrieved 26 February 2012. ^ "Jyväskylä pähkinänkuoressa". City of Jyväskylä. 25 June 2012. Retrieved 9 July 2012. ^ Anna Kivinen (2 December 2011). "Jyväskylän imago kestää edelleen". Keskisuomalainen. Retrieved 26 February 2012. ^ Erkki Niemi (2 September 2009). "Faktoista tulevaisuudeksi - muutosten fundamentit; Aluetaloudet ja työssäkäyntialueet faktojen valossa" (PDF). Statistics Finland. Archived from the original (PDF) on 16 June 2013. Retrieved 26 February 2012. ^ finnishdesign.com (2015). 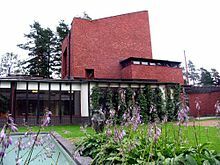 "Alvar Aalto Museum". finnishdesign.com. Retrieved 9 August 2015. ^ Jyväskylän kaupunki (2015). "Museum of Central Finland". City of Jyväskylä. Retrieved 9 August 2015. ^ Karissa Rosenfield (29 June 2015). "Alvar Aalto Foundation Launches Competition to Form Museum Center in Jyväskylä". arch daily. Retrieved 9 August 2015. ^ Quantrill, Malcolm (2012). Finnish Architecture and the Modernist Tradition, p. 108. Taylor & Francis. ISBN 1135822794, 9781135822798. ^ Yannick Ilunga (8 August 2013). "Craft Museum of Finland". Helsinki Times. Retrieved 9 August 2015. ^ Tripadvisor. "Keski-Suomen Ilmailumuseo". Tripadvisor Times. Retrieved 9 August 2015. ^ "Jyväskylä University Museum". Jyväskylä University. Retrieved 9 August 2015. ^ Jyväskylän kaupunki. "Jyväskylä Art Museum". City of Jyväskylä. Retrieved 9 August 2015. ^ Satu Heikkinen (17 January 2011). "50th anniversary of Jyväskylä City Theatre". City of Jyväskylä. Retrieved 9 August 2015. ^ "Theatres". University of Jyväskylä. Retrieved 9 August 2015. ^ "Arctic Heat Film Festival 2015". Arktisen upeeta -festivaali. Retrieved 30 October 2015. ^ "Tapahtumat" (in Finnish). Jyväskylän kaupungin kulttuuripalvelut. Retrieved 30 October 2015. ^ "Jyrock In English". JYY. Retrieved 30 October 2015. ^ "Lutakko liekeissä info". Jelmu. Retrieved 30 October 2015. ^ "Yläkaupungin yö 2015 Festival". Yläkaupungin yö ry. Retrieved 30 October 2015. ^ "Jyväskylän kesä alkaa Sataman yöstä" (in Finnish). Sataman yö. Retrieved 30 October 2015. ^ "Jyväskylä Festival in a Nutshell". Jyväskylän kesä. Retrieved 30 October 2015. ^ "Neste Oil Rally Finland - More Than a Rally - Info". Neste Oil Rally Finland. Retrieved 30 October 2015. ^ "Nordic Countries and Cultures in Athenis Finlandie 2015 - Culture Event". Athenis Finlandieae. Retrieved 30 October 2015. ^ "Finlandia Marathon 2016" (in Finnish). Finlandia Marathon. Retrieved 30 October 2015. ^ "The 13th International Printmaking Triennial. Naapurit Neighbours. Graphica Creativa 2012". Jyväskylä Art Museum. Retrieved 30 October 2015. ^ Karhunen, Marjo; Kettunen, Marja; Villaume, Marie; Claudel, Stéphanie (28 May 2002). "Sports: Jyväskylä and Epinal". Epinal and Jyväskylä: Town History Project. Jyväskylä Lyceum. Retrieved 26 February 2012. ^ Esa Sironen (2001–2003). "Kun pesäpallosta tuli pesäpalloa". Pitkäpallosta playoffseihin. Suomalaisuuskeskus Finnica. Retrieved 26 February 2012. ^ "Jyväskylä: Tulos puolueittain ja yhteislistoittain". Ministry of Justice. 13 April 2017. Retrieved 17 April 2017. 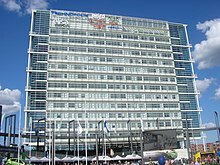 ^ "Tietoja Jyväskylästä suuralueittain". Tietoja Jyväskylästä suuralueittain. City of Jyväskylä. 7 July 2011. Retrieved 26 February 2012. ^ Arja Liinamaa (16 March 2005). "Kaunis kaupunki selkeytyy". Jyväskylä lehti. City of Jyväskylä. Retrieved 26 February 2012. ^ Liisa Harjula (March 2005). "Summary: Have you ever seen a beautiful town?". Väitös: Jyväskylän keskustan kaupunkirakenne hajosi 1950-70-luvuilla (Jäppinen). University of Jyväskylä. Retrieved 26 February 2012. 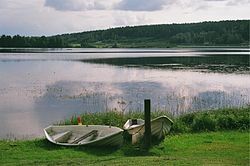 ^ "Travel in Jyväskylä Region - Places to Visit". Jyväskylä Regional Tourist Information. 2012. Archived from the original on 12 July 2012. Retrieved 26 February 2012. ^ "Tervetuloa opiskelemaan Jyväskylään". City of Jyväskylä. 2012. Retrieved 26 February 2012. ^ "Kyberturvallisuuden maisteriopinnot". Informaatioteknologian tiedekunta. Retrieved 16 March 2018. ^ "Julkaisut" (PDF). Työ- ja elinkeinoministeriö. Retrieved 16 March 2018. ^ "Creating Competence". JAMK University of Applied Sciences. 25 January 2011. Archived from the original on 11 March 2012. Retrieved 26 February 2012. ^ "Järjestäjä, liikennöitsijä ja päätöksenteko". Linkki - Jyväskylän seudun joukkoliikenne. Jyväskylän kaupunki. Retrieved 12 May 2015. ^ "Andersson eläkkeelle – Jyväskylä pohtii pormestaria". Yle Uutiset. Retrieved 16 March 2018. ^ "Poznań Official Website - Twin Towns". (in Polish) © 1998–2008 Urząd Miasta Poznania. Retrieved 2008-11-29. ^ "Twin Cities". City of Jyväskylä. 2012. Retrieved 26 February 2012. ^ Terhi Saranen (31 August 2005). "Ystävänä kaupunki". Jyväskylä lehti. Retrieved 26 February 2012. Kokko, Marja (2007). Jyväskylän kaupungin historia 1965–2007 (in Finnish). Helsinki: City of Jyväskylä. ISBN 978-952-5332-96-4. Tommila, Päiviö (1970). Jyväskylän kaupungin historia 1837–1965 (in Finnish). II. Jyväskylä: City of Jyväskylä. ISBN 951-95011-0-X. Tommila, Päiviö (1972). Jyväskylän kaupungin historia 1837–1965 (in Finnish). I. Jyväskylä: City of Jyväskylä. ISBN 951-95011-2-6. 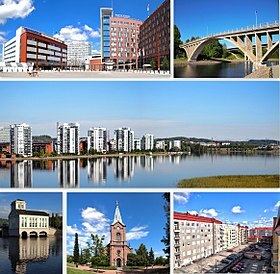 Wikimedia Commons has media related to Jyväskylä.